Hi everyone, wow, what a hop this has been! If you are coming from my dear friend Annette's blog you are right on track, if not, definitely take a look at the links at the bottom of this post to make sure you hit all the stops along the way. I am excited to be a part of this little (big) hop down memory lane. I still remember the first time I got received the happy email from Susan Opel saying one of my cards got picked for publication. Oh, how excited I was! Literally doing the happy dance. I've always loved flipping through my crafty magazines and the thought of having one of my little ole' cards in print was incredible. 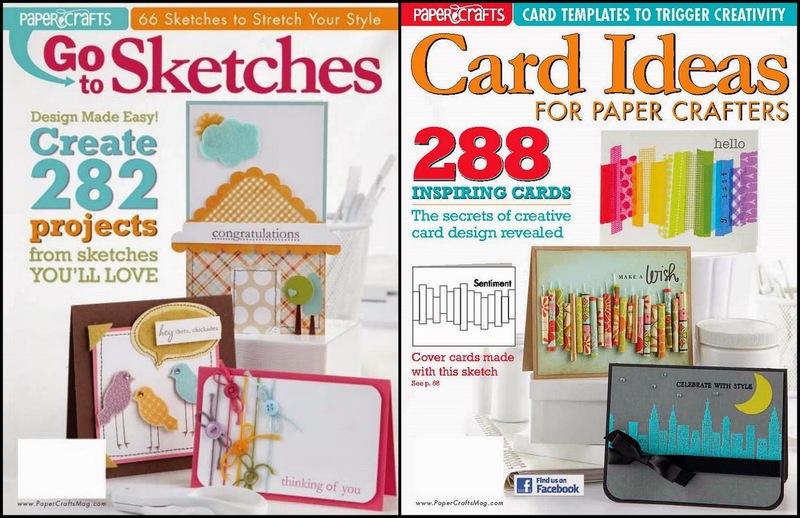 When I first heard the news that Paper Crafts was going digital I thought that we have really seen an entire industry change before our very eyes. When I first started seeing the news rapidly fly on Facebook that the magazine was forever shutting her doors, I couldn't believe it - didn't want to believe it - but sadly, it is true. I've met a few of the Go To Gals and Editors in the past couple years when I've been able to attend CHA and they are just as nice and awesome as they are online. It's been an honor to meet them and because they are so awesome, I know they will all be landing on their feet and continuing to create, inspire and be fabulous in whatever venture they decide to do next! So, in the spirit of this hop, I've created a little Thank You card. A card to thank them for their inspiration, their thoughtfulness, their generosity…it's just not enough! I wish everyone the best! I used this fab die cut from Papertrey Ink to create my background. I cut it from Simon Says Stamp Woodgrain Cardstock. Then I die cut my banner (also from Papertrey Ink) out of vellum and embossed my sentiment from Paper Smooches. I created a second smaller banner to layer on top using washi tape, sprinkled some sequins and called it done. I love this large die cut. It is definitely going to be a go to staple for my cards. It fits perfectly on a standard A2 size card which is my favorite card size to make. I don't want to go on too long as this hop is BIIIIG! 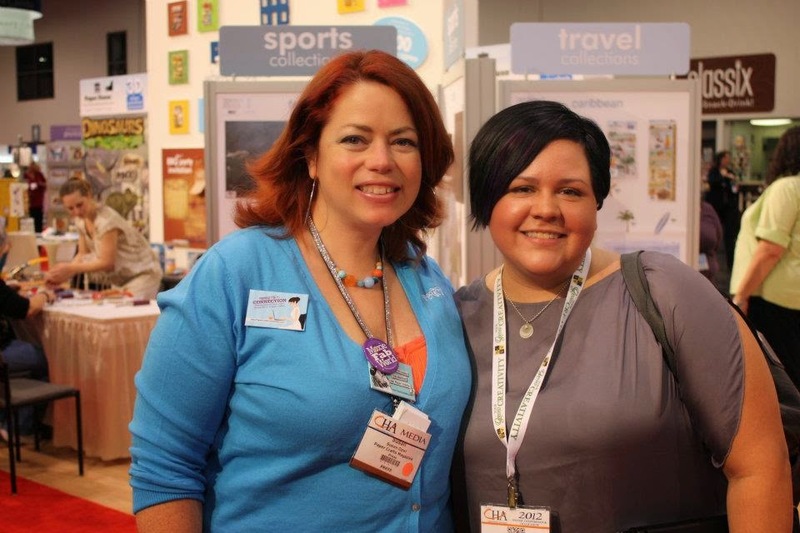 Your next stop is one of my all time favorite crafty companies: Crafter's Companion! Thanks for stopping by. I hope you've enjoyed my card - made especially for all our friends at Paper Crafts & Scrapbooking Magazine. awesome post and picture of you and susan. Pretty Card too! beautiful card~love how you used the cut out paper!!! Gorgeous card! And awesome pic! Love your photo... and your card is so sweet. Awesome card! Love the gold chevron washi tape banner!! Beautiful :) Love the gold and the teal ! The gold, oh, the gold is stunning! Love your trendy card with the chevrons and flags. I found a pair of Blitsy Golden Scissors!